This platinum rated three bedroom –two full bath condominium, completely renovated over the last 18 months, is located in a premier resort. You have the opportunity of being one of the first to enjoy this spectacular property. Sterling Shores, located just off Highway 98East, offers more than any other resort development in Destin. And Unit 518 offers you the most luxurious experience. From the balcony you’ll see Sterling Shores’ many amenities that make it the perfect Family vacation spot. First, there are spectacular gulf views. You quickly see that you are closer to the world’s most beautiful beach than other Destin resorts. Next, you will see beautiful grounds surrounding the massive lagoon pool and the separate private beach front pool & gazebo with a terrific café that serves amazing burgers, sandwiches & a wide selection of drinks. You’ll also find nearby dining options for your entire Family. The Back Porch fronts the gulf and offers the best in local seafood dining in a Family friendly setting; or a take a short stroll to the Ruth’s Chris with its patio grill & bar that offers a more casual service & drinks. After dining, wander over for ice cream at the eclectic Candy Store located just down the street. Finally, take in a movie in the theater just off the Sterling Shores lobby. When you’re back just relax and enjoy the view from the balcony, furnished with beautiful teak loungers, tables and chairs. (Have your morning coffee here too). That’s just the beginning. There’s so much new to share. The living area is gorgeous. Over the winter, all new furniture, lamps & rugs were added, including a new sectional w/ a pull out queen sleeper. The new 55” Samsung SMART TV has 2 HDMI outlets and a cable box providing expanded channels and crisp HD picture quality. The décor is comfortable and elegant. The large mirror placed over the sofa adds dimension to the room and expanded views of the gulf. The contemporary dining set comfortably seats six. And, it’s an easy step to the kitchen with everything you need to prepare a gourmet meal. The kitchen has been completely upgraded with a Kenmore Elite Stainless Steel appliances and a new high speed blender. The tiled backsplash brings the look together. The MASTER SUITE is stunning with new driftwood floor tile. It’s completely remodeled with new rugs, paint, bed linens and a 37” 1080p Flat Screen TV. From the KING bed, enjoy a wonderful gulf view or watch television while you’re relaxing. The driftwood tile carries through into the master bath which has both a jetted garden tub and a separate shower along with new granite counter tops and newly faux finish cabinets. The brand new washer and dryer in the walk-in laundry room will keep your beach things clean and fresh. And, there’s a new Coastal Carrier HVAC that keeps every corner of the residence comfortable. Great location and unit. The process was smooth in checking in and enjoyed our stay. Thank you so much for taking the time to review your stay and hope to see you again soon! While we appreciate all feedback, positive and negative, we do not feel that this review accurately represents this property. On the 19th day of his month long stay, the guest called to tell us he found the bed uncomfortable and that the resort did not have a hot tub. He never mentioned the smell of mold, that the condo was dirty, or any issues with the couch. We corrected our marketing to remove the hot tub that was listed and apologized for our mistake. The owner of this unit takes great care to provide beautiful, comfortable accommodations, and a wonderful guest experience. Sterling shores 518 is absolutely beautiful and clean with quality furniture better than any other rental we've stayed in. Excellent kitchen and spacious dining area for your family! The rooms are big with comfy beds and you get an amazing view of the Gulf from the furnished patio. The master bedroom is huge and has private access to balcony patio. Plenty of amenities such as wifi access, washer/dryer and each room has it's own flat screen TV. The condo is located just steps from the elevator which is convenient. 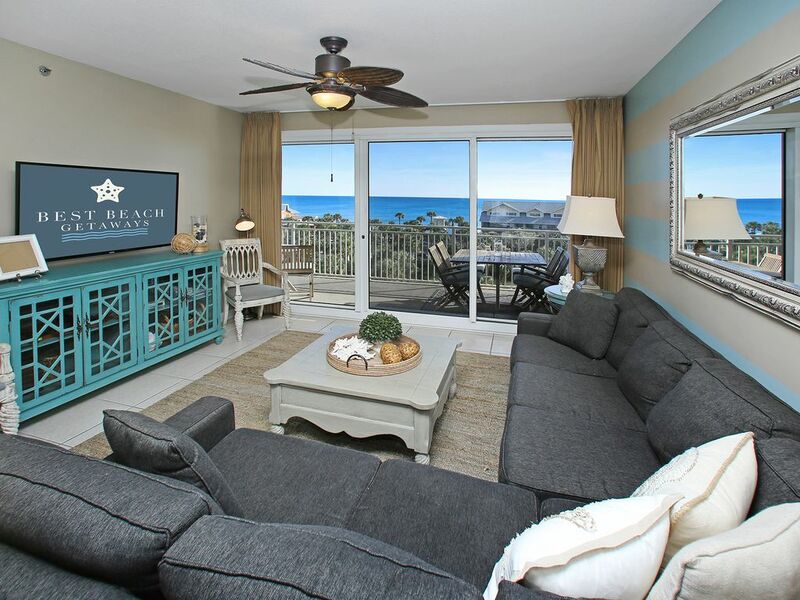 Sterling shores was very convenient with two pools, private beach access with (private bathrooms by the beach), bartender and food service that come to you right on the beach. The Back Porch Restaurant is walking distance from the condo and convenient to get lunch, drinks or dinner. By far the best place to stay! Stayed in August 2016 and fit my large (9 people) family comfortably. We were thoroughly impressed the moment we walked in the door. The condo is decorated absolutely beautiful and very spacious. The room has a huge balcony although not right on the water feels like you are. It was pleasant sitting on the patio having a cup of coffee listening to the waves. The resort has a gated entrance and multiple elevators so we never had to wait. There are MANY things to do nearby. The kids loved Big Kahuna waterpark and Merlins Pizza. The location of the condo is perfect, right in the middle of all the shops and restaurants. We felt like we could have stayed another month and still not had enough time to go everywhere. The rental company was awesome and very easy to work with and always available. Thank you Delphine for all your help. This condo is unbelievable. Every room is gorgeous! The decor is right out of Southern Living. Views are awesome. Close to everything. We're coming back for sure. The home is beautiful and the furniture is very nice, and not cheap looking like a lot of rentals. Everything went very smooth. We had a great time and really enjoyed our stay. We would rent this unit! Thank you! Sterling Shores 518 is located so that you don't have to drive anywhere. There's great restaurants and shops just a couple of minutes walk from where you are.